These are words that every Warhammer, and likely every miniature gamer, has heard before. The slogan to the most popular miniatures game ever produced, Warhammer 40k. The science fiction miniatures game produced by Games Workshop. If you are reading this article then you are likely at the crossroads looking down the path of starting into the world of miniature gaming. I could think of no more appropriate words to begin you down the path of a hobby that I have enjoyed for long over a decade now. Whether you are a fan of the fiction, you have friends who play the game, or you’ve hung around your local hobby shop and the game has caught your eye, let me first say welcome to the hobby. Reading this article will be the first step down the path towards infinite happiness and a great sense of accomplishment. This article will take you down the steps of explaining the setting a little, what to expect when playing the game, and how to collect your miniatures. There are many different miniature games on the market, each with their own setting and story. Warhammer 40k, which as I’ve mentioned is the most popular one you will see, has a rich and massive story, spread out over the span of many millennia. A brief summary of the story begins in the 31st millennium, when the forces of the Emperor of Mankind are nearly in control of the entire galaxy. The forces of earth were united by this single man and his legion of genetically altered warriors and set out amongst the stars to create the Imperium of Mankind. However the old gods of Chaos set in motion their plans which they planted at the birth of these super humans setting brother against brother in a great civil war. This war degenerated into a stalemate at the cost of the life of the Emperor, whom is now entombed in a golden throne on earth. Now, in the 41st millennium, the forces of Chaos still battle against the Imperium of mankind, while various alien races with their own agendas make their impact on the galaxy. Unlike the background story of Warhammer 40k, playing the game is much simpler. To play, all you’ll need are your own miniatures, a number of six-sided dice, a tape measure, and both the rulebook for the game and the rulebook for your own army. A table capable of playing on, along with appropriate terrain features for your miniatures to battle over are something to consider, but most game stores provide both of these things for you to use during your games. 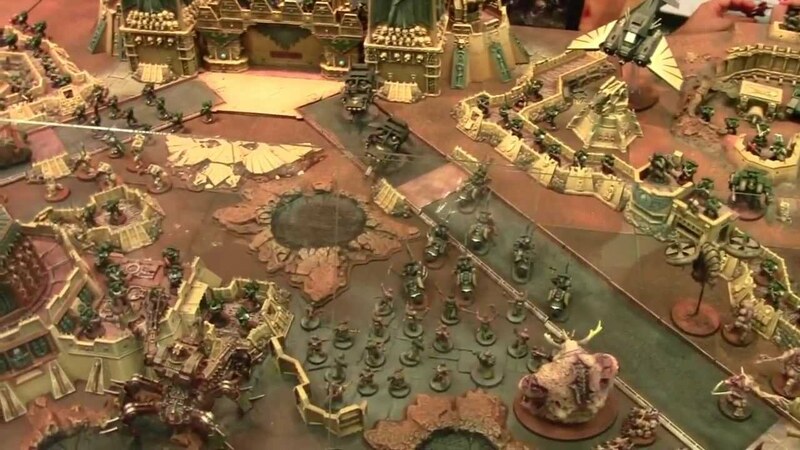 Over the course of the game, you will move your models, roll dice, and with any luck make your opponent remove his models while not removing yours. Some games are scored based on the number of models you kill of your opponents, while others are scored based on holding objectives. Collecting is another aspect of the hobby which has its own devotees. As you may not be aware the models come un-assembled and unpainted. This means that you will need some tools to create your miniatures and get them ready for the table top. You will need a pair of clippers to remove the parts of the model from the plastic frame, or sprue, that they come on. You will then need a sharp hobby knife to remove any remains of the joints where the pieces came attached to the sprue, along with any mold lines that remain from the casting process. Lastly you will need glue, either super glue or plastic glue, to attach the pieces of your model together. Once your model is assembled you will need to paint it. Games Workshop makes a great line of Citadel paints and paintbrushes which do a fantastic job of bringing your models to life. The final step is to apply some materials to your miniature’s base to give it that final touch, and then you are ready for battle. I hope this article has been helpful on introducing you to the hobby. The same techniques that I have laid out here are almost all applicable to any miniatures game out there today. So whether you play Warhammer 40k, Age of Sigmar, Blood Bowl, Warhammer 30k, or any other game, this article will provide you the building blocks that you will use to bring your models from a mere collection of parts to the table. I look forward to seeing you across the battlefield some day. This entry was posted in Articles, Review, Warhammer and tagged Age of Sigmar, Introduction, Lionel, Warhammer, Warhammer 40K. Bookmark the permalink.